Here is another Willett. This one was bottled in 2013, not for a double secret society but for a liquor store in Missouri. It’s a bit older than Wednesday’s Willett and not at a ludicrous strength, and not, as far as I know, wheated. That’s as much as I (sort of) know. So let’s get right to it. Willett 11 (58.55%; barrel 2364 for the Wine and Cheese Place; from a sample received in a swap). 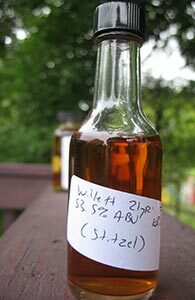 The Willett distillery stopped production a few decades ago. What has been available under the Willett marque in recent years, in their eye-catching bottles, has been sourced whiskey (at least one of which I’ve really liked in the past). In 2012, however, they started distilling again and this 2 yo rye, released last year, was one of the most anticipated releases of recent years. And when it showed up it got fairly good reviews from people (such as Sku and the notorious Bourbon Truth) who are usually allergic to hype. Sku offered me some the last time we swapped samples and I couldn’t say no. After all, my experiences with other “craft” American whiskeys have been so positive, be they from Balcones, Koval, Corsair or Charbay…. My understanding is that this is a blend of two mash bills—one that’s 74% rye and one that’s 51% rye, with far more of the high rye mash bill in the blend. I know nothing about Willett, but as it says “Stitzel” in parentheses on the label I’m pretty sure there are people who will say I don’t deserve to be drinking it. Whiskey from the extinct Stitzel-Weller distillery, you see, is one of the most prized (or hyped, depending on your point of view) commodities in the world of bourbon, and it’s quite possible that its charms are wasted on a bourbon neophyte like me. If it helps assuage these concerns let me reassure you that I only drank half of this sample as a shot with cherry Coke and Southern Comfort. And now I have my seersucker suit and my panama hat on and am sitting in a rocking chair on my front porch, drinking the rest, with my faithful hounds Ezra and Elijah at my feet. You have to forgive me–I don’t really know my bourbon stereotypes.